re/Action wants to be “a reader-funded indie publication about the games industry: its product, its players, and its culture.” That’s taken from their Indiegogo fundraising page. As of the time of this writing they have 6 days to raise $29,984. I’m concerned that they’re not going to make it. They’re asking for $41,000 in total. Kill Screen, by comparison, another publication that wanted to walk a path less traveled in video game journalism and which also raised startup money on a crowdfunding site, only asked for $3,500. re/Action is founded by, from my perspective, untested entities. Mattie Brice is a recognizable figure because she wrote an essay for Kotaku, created an indie game, was part of a feature on Polygon and was on a GDC panel this year, but I’m unaware of any professional experience she has to qualify her as an Editor in Chief. I’ve never heard Andrea Shubert’s name mentioned in any conversations I’ve had with developers, writers, or video game journalists, so she’s an unknown variable to me as a Managing Editor. Kill Screen, on the other hand, was founded by proven veterans. I keep thinking about the advice I was given in film school about making independent films. Rule number one: Never use your own money. Rule number two: Always get people who’ve made movies before on your crew. Comparing re/Action to Kill Screen could not be more of an apples to oranges comparison, but I’ve been making it in my head by way of not looking at a failure of re/Action to get funded as any sort of referendum on the audience and what kind of writing they do and do not want to read. Succeed or fail I respect what Brice and Shubert are doing, because it’s brave. And I wish they could raise the money to run re/Action for six months, just to see whether or not they could garner enough of a readership to successfully raise additional funds six months from now and keep the outlet going. It would be nice to see another outlet succeed at what Kill Screen wanted to do, and actually bring more substantive change into paid video game journalism. It feels like “changing game journalism” is more of a marketing pitch nowadays for sites like Polygon and the Penny Arcade Report than it is an actual accomplishment. It would be nice to see some more people deliver on that promise for real. I am not — repeat, not — ragging on the quality of what Polygon and the Penny Arcade Report do. They produce quality work, but it’s the same kind of work I’ve been seeing for years. Polygon’s thirteen-part documentary on themselves, Press Reset, presented a vision of an outlet that would run a more mature level of video game journalism for an audience that wanted more than the traditional fare. I wish people would be specific and cite outlets when they say things like this. They meant IGN and their ilk. And so Press Reset told the story of a band of industry veterans taking their work very seriously in order to produce this new and different kind of outlet. They do take their work seriously, but they didn’t produce anything all that different from what came before. They made two changes to the usual fare. Polygon expanded feature word counts way, way above what is normal. 1,500 – 2,500 words is pretty standard for a feature in video game journalism. I wouldn’t be surprised if some Polygon features ran 10,000 words if you include the sidebars. At twenty five cents an edited word, really long form features are good news for the freelancers that land the gigs. I’ve pitched Polygon before and Lord knows I’ll pitch them again, provided I don’t piss anyone off with this blog post, because they also delve into topics that I find interesting. But long form journalism, or the type of subject matter Polygon publishes, are not change. “We want to be what early Rolling Stone was to rock n’ roll or Wired was to tech,” said the Kill Screen Kickstarter page. “We’re talking about the long format read on the creative minds behind AAA and indie game titles sided by the personal essays about what games mean as part of our daily little lives.” That’s from late 2009, a full three years before Polygon. Where Polygon brought more substantive change was in their review system that includes evolving scores, but the jury is still out on whether or not that’s a good thing. The SimCity review debacle weighs heavily for the case that it is not. If we’re being brutally honest the first review score, the score that goes on Metacritic, and the score that helps consumers decide whether or not they purchase a video game on launch day, is the only review score that counts. I don’t think evolving review scores fulfill the promise that Polygon sold the audience on with Press Reset. As for the rest of their content, it’s as solid as you would expect from a gaggle of industry vets, but it’s also what they were doing at other outlets before they came to Polygon. It’s not change. The Penny Arcade Report consistently runs good long form pieces, but it also features a news section that runs the kind of short, reblog-y, value-neutral content that everyone else runs, which was ostensibly one of the problems the PAR wanted to “fix.” In any case, the PAR doesn’t represent meaningful change any more than Polygon did. Ben Kuchera is writing the same sort of content he wrote on Ars Technica for years. The PAR’s approach isn’t additive, it’s subtractive. They subtract what they feel is the garbage, try to focus on what they believe is substantive, but that substantive content itself is no different than the substantive content we can find on a multitude of other video game journalism sites. Let me reiterate: Nothing I just said should be taken as ragging on either Polygon or the Penny Arcade Report. Very good work is regularly published on both sites, but they’re additions to the video game journalism establishment, not changes to or meaningful improvements upon. Not from the big picture point of view. Meaningful change doesn’t come from inside establishments. We only have to crack open a history book to demonstrate the truth of that statement. Meaningful change comes from the outside, and that’s why I was hoping re/Action would get funded. We’ve already had an inkling of the sort of thing re/Action could accomplish. Samantha Allen posted “An Open Letter To Games Media” on re/Action on June 19. In her letter, Allen called out the editors of IGN, Kotaku, Gamespot, Polygon, Destructoid, and Joystiq, to shine a spotlight on the prejudice thrown at marginalized groups in video game culture. Allen called upon these editors to exercise control over the “sexism, racism, classism, ableism, homophobia, and transphobia” taking place in the comment threads on their websites. Allen called upon these editors to not simply throw their hands in the air and accept this sort of internet hatred as the status quo which cannot be fought. In response to this open letter two of the largest video game websites in the world, IGN and Kotaku, addressed their comment policies. Whether or not their efforts bear any fruit at reducing the toxic content in their comment threads is moot for the purposes of our discussion. That Allen’s complaints were spoken to at all is a poignant example of how meaningful change can be inspired from outside an establishment, because entities outside the establishment have nothing to lose from truly challenging the status quo. It’s a balancing act to be sure, as commercial enterprises can’t just entirely abandon the traditional fare that generates the web traffic that generates profit, for instance by proving the value of the ad space, but there aren’t enough video game journalism outlets putting weight on the other side of the video game journalism scale to effect meaningful changes across the entire industry. Video game criticism websites like Nightmare Mode and The Border House try to create safe environments for diverse audiences, so re/Action’s promise on that score is nothing fresh and new. 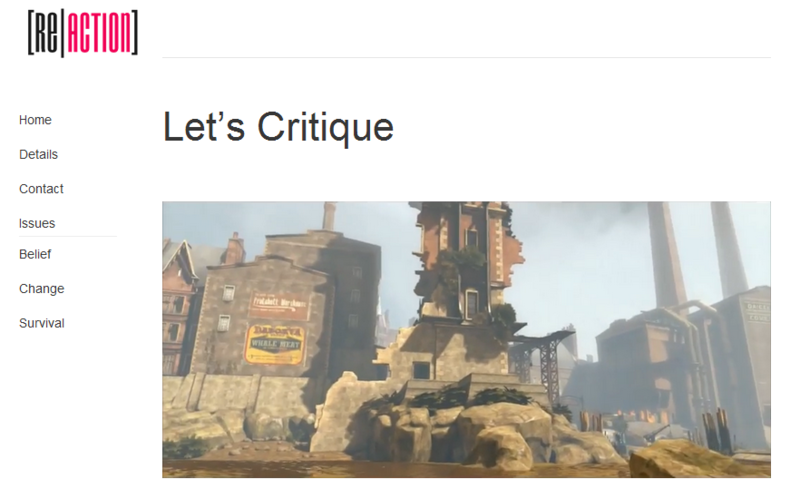 The meaningful change that re/Action wants to bring about is consistently paying writers for video game criticism. Mainstream game journalism sites do pay for criticism sometimes, but not nearly enough. $200 for a freelance piece, what re/Action would like to offer its writers, is a very healthy rate. I might only get $100 for a well-researched feature that’s published on a high-profile, well-respected outlet, and if you’re a freelance writer your time and effort is best spent on the outlets that offer you the highest rate. If re/Action gets funded and can actually pay $200 for each piece they ought to attract good writers to produce good content. Other than Kill Screen I cannot think of an outlet that was founded on the premise of making criticism and cultural essays their mainstay content and which also accepts freelance submissions and pays for commissioned pieces. re/Action wants to help fill a void, and I admire the gumption of making the attempt. To be perfectly and entirely fair, the call for a different sort of writing about video games is as much a marketing tool for re/Action as it was for Polygon and the Penny Arcade Report, but unlike those latter two sites which are competing for the attention of the traditional video game journalism audience just like all the other, traditional video game journalism outlets, re/Action specifically wants to create content for an underserved audience. That, to me, is a change that isn’t just marketing material. It’s meaningful change, and I’d like to see re/Action get a shot at publishing a truly different kind of writing about video games, and hopefully provide another example that there’s an audience willing to pay for it. Dennis, July 26, 2013. No Comments on On re/Action and meaningful change in video game journalism. Category: Posts.